Daily Illuminator: Munchkin Shakespeare Returns! January 31, 2018: Munchkin Shakespeare Returns! Before our primary warehouse closed for the holidays last year, the team shipped out the last copies of Munchkin Shakespeare Deluxe. Thousands of games sold and shipped in the last few months of 2017, and that would have been the end of the title for a year or so . . . if there hadn't been a slight error at the factory. 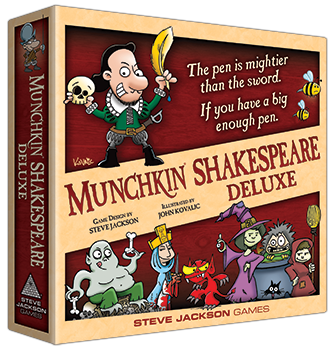 A few thousand copies too many of the core Munchkin Shakespeare Deluxe game were accidentally manufactured last year - so when we saw the demand, we happily asked the factory to ship us 2,000 extra copies, just in case demand was high enough that we needed them. Good news! Those extra Munchkin Shakespeare Deluxe have now arrived, and we're shipping the games to distributors ASAP. These won't last long, though, which leaves us asking: Do we go ahead and ask the factory to ship the last 2,000 games to us for delivery in the spring? Hmmm . . . NOTE: It is only the core title that was over-produced. All of the Munchkin Shakespeare accessories and expansions were printed to the proper numbers, and we're down to less than 1,000 of each of those items. Get 'em before they're all gone!